Tim Miles knows he isn't some sort of scheduling savant. He got lucky last season. And he's not trying to camouflage how he scheduled Colorado State's nonconference games last season as the Rams' coach. "We were fortunate," said Miles, who is now at Nebraska. "What we did was look at our league and try to figure out how many top-100 games we would get in our league. We thought we'd have them in New Mexico, UNLV and San Diego State [twice each]. We were worried about losing BYU [to the WCC], so we thought we needed one more." The Rams scheduled a one-way guaranteed game at Duke. CSU lost by 23. 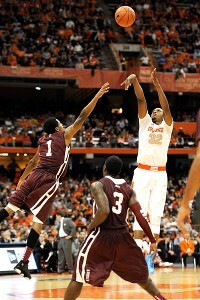 "We did it for the exposure, to play a Top 25 team and a good RPI game," said Miles. The Rams received an NCAA bid last season because CSU won key Mountain West Conference games at home against UNLV, New Mexico and San Diego State, not because of its nonconference schedule. As we've examined nonconference schedules in a number of high-profile leagues this week on ESPN.com, it's clear that there are exceptions to the rule. CSU was one last season. The Rams lost to Southern Mississippi and at Stanford; the former was an NCAA team and the latter was the eventual NIT champion but not a candidate for a bubble spot in early March. Miles said he jokingly called his athletic director State Farm because he liked being such a good neighbor by playing Denver, Colorado and Northern Colorado. The Rams won all three games last season, two of which were in Fort Collins -- including the win against the eventual Pac-12 tournament champ Buffaloes. But don't think for a second that Miles has somehow figured out the system. He hasn't. He admits he just didn't want to play teams that would hurt him. And he didn't, as the four nonconference regular-season losses (Duke, Southern Miss, Stanford and Northern Iowa) were all "good." The problem is that, outside of beating Colorado, which at the time didn't appear to be a high-profile win, there wasn't a victory to scream about when MWC play began. Miles left his successor, Larry Eustachy, a potential MWC top-three team and a squad that could return to the NCAAs, especially with the addition of Minnesota transfer center Colton Iverson. He said he left the Rams with games against Denver, CU and Northern Colorado, a series with UTEP and the Las Vegas tournament that doesn't have an NCAA-bound team (Portland, Virginia Tech and Bradley). Eustachy added games at Washington, at UIC and a home game against St. Bonaventure. Eustachy also added two non-Division I games against Chadron State and Adams State. If the Rams do get into the NCAA tournament, it will be on the strength of the MWC top-100 teams. And this season, there could be four bids, in addition to CSU, with UNLV, San Diego State, New Mexico and Nevada all viable candidates. The scheduling dilemma for teams on the bubble is legitimate. Ole Miss coach Andy Kennedy defended his perceived mediocre schedule on a number of fronts. He said the Rebels had to wait to see how the SEC would divvy up the new 18-game format with the addition of Missouri and Texas A&M. The Rebels got Missouri and Tennessee twice and Kentucky (home) and Florida (road) only once. Those schools should be the top four teams in the SEC this season. Kennedy said he didn't know who the Rebels would get in the Big East/SEC Challenge. Ole Miss will play a home game against Rutgers. But there was likely no chance it was going to get a marquee Big East team in this made-for-TV event. Ole Miss is in the Diamond Head Classic, but the Rebels better play San Diego State in the semifinals and would benefit from playing Arizona or at least Miami to get two quality games out of the event. Ole Miss can't afford to leave Honolulu without playing (and beating) one of those teams. Kennedy said few BCS-level teams would play at Loyola Marymount on the way to Hawaii or at Middle Tennessee State. He's right. Those are games where the team will be rewarded if they win and hurt if they lose. The rest of the schedule won't move the meter for the Rebels. The Ole Miss coach wanted to upgrade the slate, but Kennedy had no control over the Big East/SEC Challenge or the opponents in Diamond Head. He could have added one or two quality nonconference games, but who would sign up for a home-and-home series with Ole Miss? The Rebels nearest high-profile Division I school -- Memphis -- wants no part of them. Kennedy has used his relationship with Bob Huggins to get West Virginia to Oxford, but that series has ended. So Ole Miss, much like CSU last season and again this season, will have to earn a bid by playing well in conference, despite the selection committee's plea to schedule up in the nonconference. Colorado State's strong RPI, quality conference home wins and gaudy strength-of-schedule number give it the look of a team that's a lock to be off the bubble and in the NCAA tournament. Sure, the Rams have an RPI of 27, an SOS of No. 4 and home wins over San Diego State, UNLV and New Mexico. But they also have only two road wins -- at UTEP and at Northern Colorado, both of which are below 100 in the RPI. Is that enough to put an 18-10 team into the NCAA tournament? "We're not done yet," said Colorado State coach Tim Miles, whose team is fresh off the third court-storming of the season after it beat UNLV on Wednesday night. "We're not going to win the eye test, the smell test, the airport team," Miles said. "But we can win on the floor." The Rams travel to rival Air Force on Saturday to try to finish the conference season with eight wins. "We've got to beat Air Force; winning on the road is our weakness," Miles said. The excuses for Colorado State's early-season swoon can be pinned on the absence of forward Pierce Hornung. Hornung got knocked out against Stanford on Nov. 15, sustaining a concussion. He played 28 minutes against the Cardinal but the Rams floundered and lost by 12, 64-52. They went 3-3 without Hornung, including losing by 21 to Southern Miss, by six at Northern Iowa and then a humbling beat down at Duke by 23. Would they have won any of those games with Hornung healthy? Possibly, since Miles said he's the Rams' best defensive player. The NCAA tournament selection committee is supposed to take injury absences (more so than suspensions) into account. Still, the Rams had opportunities when Hornung was healthy and whiffed on the road in the MWC. They lost by 19 at rival Wyoming and fell in one- and two-possession games at TCU and Boise State. "We gave away the TCU and Boise games," Miles said. "We don't have the depth at guard so it's hard for us to get easy baskets, and that's why we struggle. Miles tried to schedule up, and playing Southern Miss, Northern Iowa and Duke isn't bad at all in the nonconference season. The annual game with Colorado is now a legit affair with the Buffaloes being winners under Tad Boyle. The Rams also have a decided home-court advantage. Moby Arena had its moments under Stew Morrill in the '90s. But Miles said it had been the Moby morgue at times in recent seasons. However, this season the joint has been jumping. To add to the excitement, there's a live ram courtside at the start of games (although the mascot got a little too excited and made a small mess at center court prior to tipoff Wednesday night). "He's nervous," Miles said of the live mascot. Regardless, the home atmosphere now gives CSU an advantage. Miles said the argument that the Rams can't win on the road is irrelevant to some degree because NCAA tournament games are played at neutral sites. Miles' pithy comments usually come in the form of tweets. He even tweets at halftime of games, although technically his sports information director is standing in the locker room sanitizing his speech to the team and posting it directly on Miles' Twitter account. "It's no different than a halftime interview," Miles said. If the Rams make the NCAA tournament, it would mean half the Mountain West was in the tournament (joining likely locks New Mexico, UNLV and SDSU), quite a feat for a league that is losing multiple members in a year and merging with Conference USA. "Last year we couldn't beat the top teams in the league, and we were the No. 3 seed in the NIT," Miles said. "This year we've done that. But we're not done yet." 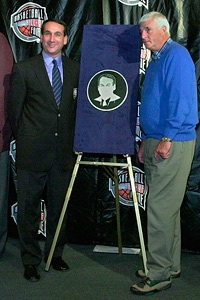 AP Photo/Charles Krupa Mike Krzyzewski and Bob Knight are tied atop the all-time wins list, but Krzyzewski could set the new mark against Michigan State at the Champions Classic. 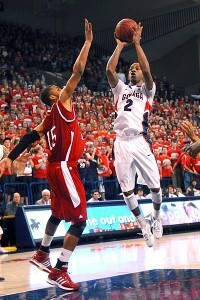 James Snook/US Presswire Gonzaga's Marquise Carter hopes to find his shooting stroke against Washington State. 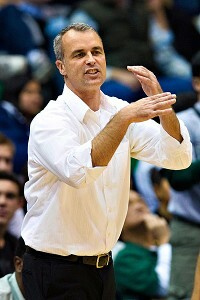 Douglas C. Pizac/US Presswire Gib Arnold's Warriors look to make a good first impression against Cal State-Northridge.